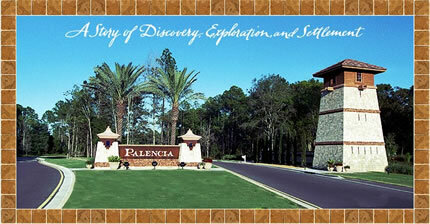 Palencia Community in St. Augustine, Florida. Developed by Hines, Palencia is destined to be one of Northeast Florida's most desirable and naturally breathtaking new communities. Recently honored with a prestigious Best in America Living Award (BALA) for Best Smart Growth Community from the National Association of Home Builders, Palencia is sited along the 2 miles of scenic Intracoastal Waterway and Marshall Creek on 1,450 acres off historic U.S. 1 between Jacksonville and St. Augustine. Palencia is located in St. Johns County, a unique place where important history, natural beauty and economic progress are friendly neighbors. With nearby beaches and waterways, preserved wetlands, eclectic shopping and dining, and easy access to downtown Jacksonville, it's no wonder St. Johns County is one of the First Coast's most desirable areas. Palencia offers 2,642 residential homes, 300,000 square foot of retail space, 600,000 square foot of office space, unparalled amenities and a wide variety of housing opportunities. Community amenities include an athletic park, a swim and fitness center, an 18-hole championship golf course designed by Arthur Hills, a 10-court tennis center, a golf clubhouse and more than 30 acres of parks with walking, biking and jogging trails. Palencia's master plan was creatively designed to blend a wide variety of home styles and price ranges into one community. 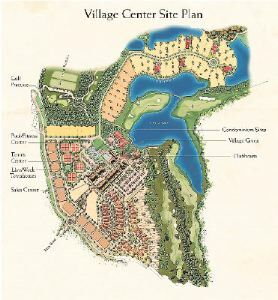 Palencia includes single-family homes, townhomes, condominiums, multi-million-dollar estate homes, unique live/work units and marshfront estate lots. Builders include Arthur Rutenberg Homes, Benchmark Homes, David Weekley Homes, John Kenny Construction Co., McCumber Homes, Morrison Homes, Panitz Signature Homes, Richard R. Dostie / A Toll Brothers Co., North Florida Builders, A Woodside Co., The Vintage Group, Trident Realty Corp., Jim Hardwick, Brylen Homes, and Crosswinds Communities. Palencia has been recognized for quality residential construction, recreation, shopping, golf and a spectacular natural landscape, all found in one community. Ideally situated as the central gathering point of the community, Palencia Village features the golf clubhouse, the swim and fitness center, the tennis center, the golf practice facility and the picturesque Village Green. In addition, Market Street -- the main thoroughfare in the village -- is designed for small retail shops, offices and live/work units. This proximity creates a true community, promoting neighborly interaction from a bygone era. The Palencia Club, the community's private championship golf club, was designed by Arthur Hills. The par-72, 7,017-yard course creates a one-of-a kind golf experience by weaving through a terrain of ancient live oaks, open marsh and coastal scrub oaks, providing beautiful views of the Intracoastal Waterway. The 33,000-square-foot, award-winning private clubhouse features a luxurious, members-only dining room, a bar and grill overlooking the spectacular 9th and 18th greens, banquet facilities and a public cafe. Palencia also features an extensive network of boardwalks. When completed, they will reach out to a handful of preserved natural islands along the Intracoastal. Other neighborhood recreational choices include nature trails, green spaces and parks with ball fields, playgrounds and pocket parks. Palencia offers a wide variety of high-end homes range in price from $400,000 to over $3 million, and condominiums from $200,000. Select lots are available and range in price from $325,000 to over $1 million.